Guns and Book Clubs: What’s the Connection? 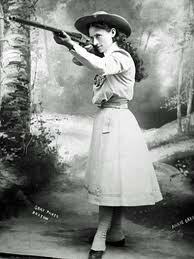 Women have been gun enthusiasts since the days of Annie Oakley, but I'm intrigued by the idea of a book club at the shooting range. makers have “set their sights” on female buyers and that women make up a growing percentage of gun owners. One of the women they interviewed goes to the shooting range—with her book club. One wonders what they could be reading to inspire gun training… self –empowerment books? Violent books about women being attacked? Westerns? I have to admit I’ve never shot a gun myself, but I don’t have any objection to gun training and I would go to a gun range if someone really wanted me to go with them, just for the experience of it. Moreover, I don’t think gun ownership certainly should be the exclusive domain of men, but that story really piqued my curiosity. Why would a book club go to a shooting range? That prompted me to go on line for a little investigation and of course it led me to a huge array of books on the topic of women and guns, not to mention this great photo of the Jane Austin Book and Gun Club. My book club(s) have gone to movies, dinner, cabin weekends, spas and all sorts of jaunts together. I spoke with one woman whose book club goes on a fishing trip every year, but I haven’t heard about shooting together. Guns and books seem such an unlikely pairing. I know that some book groups have difficulty keeping their discussions under control and because one or two members tend to dominate the discussion. Or, they may disagree about what book to choose or stray from the discussion too often. Packin’ heat might be one way to keep them in line. This entry was posted in Ideas for Book Clubs and tagged book club, women and guns. Bookmark the permalink.